Crestwood Mennonite Brethren Church, Medicine Hat, AB. The Crestwood Mennonite Brethren congregation was founded in 1965 by the Alberta Mennonite Brethren Home Missions. In 1968 the congregation officially organized and joined the Alberta Conference of Mennonite Brethren Churches and Canadian Conference of Mennonite Brethren Churches. They met in rented facilities until 1969 when they completed construction of their own meeting house. They allowed inter-Mennonite individual membership from 1975. The congregation received members of the Seven Persons Church when that congregation dissolved in 1975. Mennonite Brethren Herald (27 May 1988): 4; (13 September 1991): 16; (10 November 1995): 16; (4 February 2005). Mennonite Reporter (23 February 1976): 3. Toews, John A. A History of the Mennonite Brethren Church: Pilgrims and Pioneers. 1975: 167. Available in full electronic text at: https://archive.org/details/AHistoryOfTheMennoniteBrethrenChurch. Centre for Mennonite Brethren Studies, Winnipeg, MB: Volume 337. Epp, Marlene and Sam Steiner. "Crestwood Mennonite Brethren Church (Medicine Hat, Alberta, Canada)." Global Anabaptist Mennonite Encyclopedia Online. March 2016. Web. 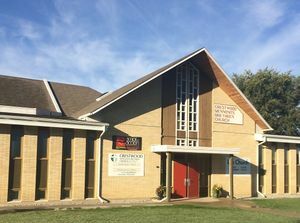 25 Apr 2019. http://gameo.org/index.php?title=Crestwood_Mennonite_Brethren_Church_(Medicine_Hat,_Alberta,_Canada)&oldid=163613. Epp, Marlene and Sam Steiner. (March 2016). Crestwood Mennonite Brethren Church (Medicine Hat, Alberta, Canada). Global Anabaptist Mennonite Encyclopedia Online. Retrieved 25 April 2019, from http://gameo.org/index.php?title=Crestwood_Mennonite_Brethren_Church_(Medicine_Hat,_Alberta,_Canada)&oldid=163613. This page was last modified on 11 March 2019, at 02:06.